Late on a Friday morning, Seth Alexander says he wants to enjoy the day’s clear weather. “Finance guys don’t get to see a lot of the sun,” he says. The Cambridge-MIT Undergraduate Exchange, the British school’s only exchange program with a U.S. university, has seen higher student demand from Cambridge students than MIT students, consistent with previous years. About 50 MIT students applied to the program this year, according to Senior Associate Dean of Undergraduate Education Margaret S. Enders. Cambridge, on the other hand, had an applicant pool of over 100 students. Started in 2000, CME is a one-year program for third-year undergraduates, who pay normal tuition to their own universities. 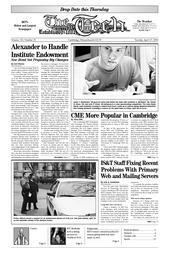 Over the past week, Information Services & Technology has seen a variety of problems with web.mit.edu, MIT’s primary Web server, and also with the mail server outgoing.mit.edu, which is responsible for accepting outgoing e-mail from campus users and routing it to the correct destination.